sryo: sl st to right hand needle with yarn in front, then pull yarn to back of work over the needle – st looks now as if there are two sts. This sryo double stitch is always knit/purled together as one st.
the short row heel is worked over half of your total stitches. You knit that half of your stitches. Turn, make a sryo as described above. Put sryo onto spare needle. P to the end of row. Turn, make a sryo as described above. Put sryo onto spare needle. *K to end of row, turn, make a sryo, put sryo onto spare needle, p to the end of row, turn, make a sryo, put sryo onto spare needle. 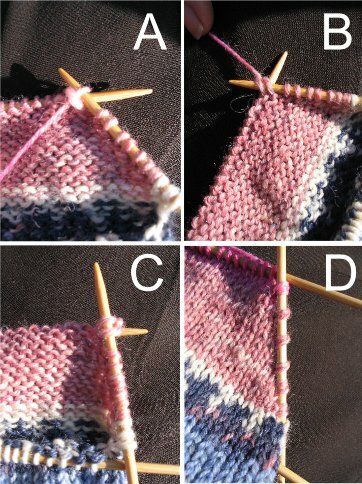 * Repeat * to * until 1/3 of total heel sts are left on main needle. Work 1 rnd over all sts. K across sts on main needle, k1 from spare needle,*turn, sryo, p across main needle, p1 from spare needle, turn, sryo, *k sts of main needle including sryo st (double st worked as one), k1 from spare needle, turn, sryo, p across main needle, p sryo double st as one, p1 from spare needle, turn, sryo,*. Repeat * to * until all sts from spare needles have been worked. You should now have as many stitches as you cast on!